(1920 1961) Land Agent at Rydal. From the beginning of the Century we soon arrived at the outbreak of the First World War which changed the whole character of country life as it was then known. In those days Rydal Hall employed a large staff of grooms, gardeners, woodmen and so on, but with the passing of the years all this has changed and Rydal Hall the residence of the Le Fleming family for so long is now an hotel. though it still belongs to the family as do most of the houses and land of the Parish. Early in the Century the motor car had arrived and with it the intolerable nuisance of dust until it was found practicable to have the roads treated with tar. All through the village there were water taps placed by the roadside from which the inhabitants of the larger houses used to water the roads to Keep down the dust. The advent of the motor car was soon followed by the first motor coaches so that the inhabitants were not tied down quite so much to their own village life and were able to enlarge their horizons. 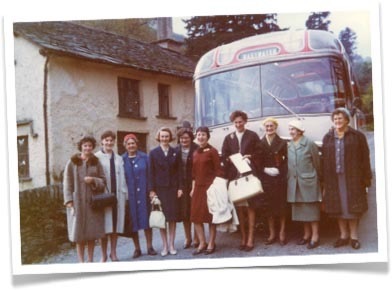 This meant that a journey to Kendal or Keswick was no longer such a great enterprise though in the early part of the Century the ordinary people would still walk long distances to visit friends and relations, distances which today would not be undertaken except by bus or car. So we get away from the old parochial life and the increased travel facilities also reflected itself in the greatly increased number of day visitors. With more and more traffic on the roads these became too narrow and widening was carried out by Nab Farm and Pelter Bridge in the 1930’s and in 1955/6 through the main pan of the village. Country life during this period has been much changed too by the advent of electric light, the telephone, radio and television, though it is pleasing to note that the old community life is not yet gone though perhaps it is now altered a bit in character. A new Women’s Institute was started here three years ago and the Young Farmers Club new meets in the Reading Room regularly. The Reading Room, once the barn of a smallholding was opened as a recreation room for the men of the village about 1900. In the early years of the century Rydal was privileged to have as residents at Rydal Cottage a trio of talented women, the two Miss Armitts and their married sister Mrs Harris. Each in her particular sphere was an expert and it has been said that no other house had settled so much female talent since the days of the Brontes. 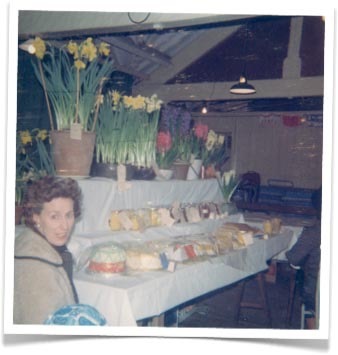 Most of us know the book called "Rydal” which gives the history of the village from earliest times and almost up to the period we are now dealing with, this was the result of long research particularly in the Rydal Hall muniments by Miss Mary Armitt. We are all indebted to this book and it is most unfortunate that the Author died before she could complete it. (this was done by Canon Rawnsley). The Wordsworth connection with Rydal has continued through this period by Mr. Gordon Wordsworth, Grandson of the Poet who lived for so long at the Stepping Stones until his death in 1934 and whose loving care of the Rash Field was a great example of devotion to duty which was one of the leading characteristics of his life. His neice Mrs Dickson, now carries on the family tradition. 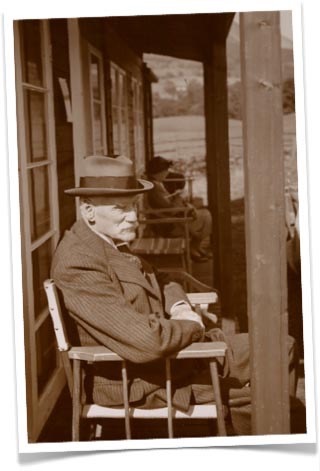 Mr. Gordon Wordworth on his death bequeathed the Rash Field to the National Trust (21.1.1935) and the daffodils which grow there in abundance now give pleasure to thousands of visitors each year. Mr. Stanley Ie Fleming, (right) became the Squire on the death of his father in 1898 and continued to live in the family residence Rydal Hall, until his death in 1939. He had two sons and two daughters. His eldest son Michael took over the Estate and is the present owner. The only member of the family now residing in the village is his sister Mrs. Joan Curwen. In 1923 Rydal had the excitement of a Royal visitor in the person of Queen Wilhelmina of Holland and her family who tenanted Rydal Hall for several weeks. An oak tree which the Queen planted in the Hall grounds has grown to be a fine specimen. (This tree blew down in a big gale in 1976). 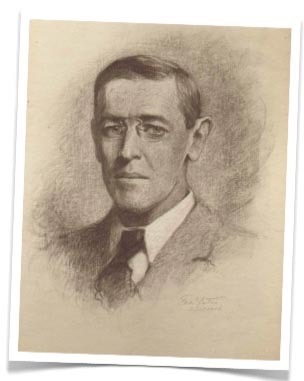 Also we were privileged to have as resident for a short period, Woodrow Wilson, later to become President of the U S.A. He stayed at Loughrigg Cottage. (Wilson is pictured on the left, in the pastel made in Rydal by Fred Yates in 1906). It has been said that the age of village characters has passed. This is arguable, but in the past all small communities seem to have had their characters. Many of us remember Mary Tyson of Bank Foot who at one time ran the village school, now no more and was organist at the Church. Although latterly she rarely left her house there was nothing that escaped her notice, and by her knowledge of the people she was a valuable link with the past. Bank Foot, a very old house and formerly an Inn came to a sorry end when it was burned down in 1941. Part of the original house has since been rebuilt. In 1940 Liverpool College for Girls were evacuated from Liverpool and settled down to continue their educative work in Rydal Hall, Bank Foot and Rydal Lodge. Their stay throughout the War proved to be a very happy one both for the people of Rydal and the School, and it was with mixed feelings that we saw them go. We also welcomed evacuees from London in 1940. Durlng the long reign of Mr Stanley Le Fleming many houses were built including Steps End Cottages, Hart Head Cottage and Keena Close, Scandale Brow, Rydal Farm house and Rydal Farm Cottages. Also a great many trees were planted but most of these had to be cut down during World War 2., just as they were becoming features of the landscape. 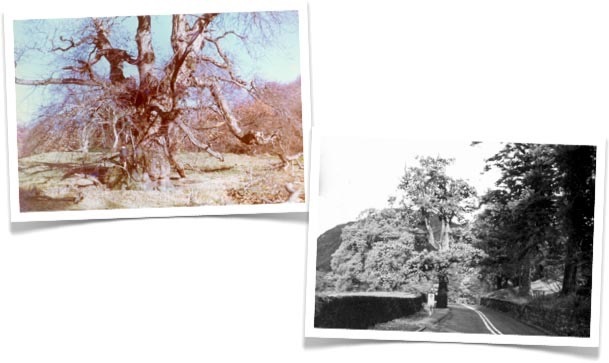 Two of our interesting trees are the Spanish Chestnut (below, left) in the Hall grounds, stated to be the largest of its kind in Britain, and the Lords Oak (below, right) which is still growing by the roadside on the way to Ambleside. It is interesting to note that nuts and acorns from these two trees have been collected and from them a new generation has arisen so that when the life of the old trees is over there will be others from the same stock. 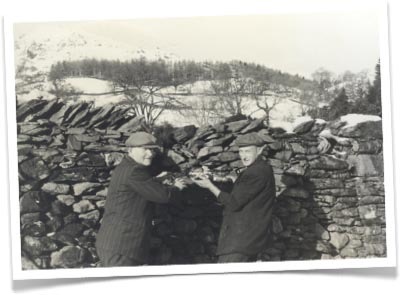 From the days when most of the villagers worked small holdings and grazed their animals on the common land we now have only 3 farms in the Parish, Rydal Farm Hart Head and Nab Farm. The great increase in the tourist lndustry is shown by the changeover of several private houses to private hotels. We have no Pub. In 1942 ahed the death of our Vicar Mr. John Arthur Legh, (1898-1942) the Parish of St Mary’s Church Rydal was made a joint one with St Mary’s Ambleside and since then we have shared their Vicar. The Vicarage was sold as a private house.